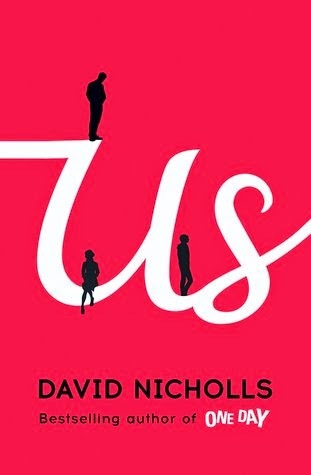 After his breakaway hit, One Day, broke our hearts in 2009, David Nicholls has earned the right to be seen as a certain kind of commercial fiction writer. He almost has his own genre. In a recent review, the Sydney Morning Herald debated the difficulty of classifying Nicholls's novels-- as outwardly they seem like what gets called "Women's Fiction" (and why, oh why is this even a thing), and yet Nicholls is, surprise, surprise, not a woman. His characters are not all women. His readers are not all women. Yet his novels are somehow too light-hearted to be straightforward literary fiction, and too... cynically realistic.... to be purely commercial fiction. And then, of course, his latest novel Us was long listed for the 2014 Man Booker Prize. Us, a novel about a fifty something year old scientist who embarks on one last tour of Europe with his disintegrating family, did not make the short list, announced September 26th, and I can't say that I am surprised-- not because it is a bad book, far from it-- but because while the Booker judges seemed to act out of character by including not only Us but David Mitchell's quasi-fantasy epic The Bone Clocks, and quickly remedied this change of heart by including only those highest of brow novels on the list. But good on them for dipping their toes in the water. Douglas falls madly in love with Connie when he first meets her at a disastrous, artsy, pretentious dinner party thrown by his sister, and she is right from the get go not his type. Douglas is ordered, scientific, and a little bit of a philistine, although he does attempt to learn about art and music for Connie's sake. Their unlikely marriage is marred by the death of their first born daughter at a few days old, and while it is never outwardly stated, this appears to be a shadow that hangs over them and their son for the rest of their lives. The novel begins with Connie waking in the night and announcing to Douglas that she thinks she might leave him. Douglas, thinking that having Connie is the only thing that makes him worthwhile, the only thing that makes him make sense, is desperate for this not to happen. The pair embark on a tour of Europe ('like inter-railing with your parents'- Albie says) with their moody teenage son Albie in tow, Douglas determined to win his wife's love back and save their marriage. The story is told through a series of something like one hundred and thirty short scenes, numbered and titled with bizarre names that make sense by the time you've read them. It shifts back and forward in time, telling the story of the Petersen's trip in a linear fashion interspersed with relevant past anecdotes; their courtship, the death of their daughter, things that Douglas might have done in the past to make Albie hate him. At first, it seems like the most obvious of plots, but Nicholls is of the Thomas Hardy school of fiction. Things are never going to go in the most obvious direction. One thing that struck me about the novel was that it showcased yet another example of a story about relationships between semi socially-inept scientists and vivacious artistic, chaotic, hot-mess types. With the recent success of The Rosie Project and its sequel, I couldn't help but think that maybe this book was a kind of higher-brow The Rosie Project; what saved it from being the same old same old was the beautiful setting (both literally, in Europe, and figuratively, in the metaphors evoked by the different artworks.) Nicholls's settings are almost characters in themselves, something that the publishers have been quite aware of when designing the cover. Inside the front and back there is a very basic map showing the shape of the journey that Douglas makes, and this is extremely clever as it helps the reader who is unfamiliar with European travel to realise how much Douglas really put into the trip for the sake of saving his family. As a narrator, Douglas's voice is authentic and while he isn't always the most lovable of men, his actions always make sense to him. As an unreliable narrator figure, Nicholls is very clever in the way he allows the reader to see Douglas's point of view, but also Albie or Connie's, through the misinterpreted reactions of the other players in the scene. While it seems like quite a simple book, I imagine it would have been extremely difficult to get right. There are moments also, when I felt Nicholls expressing his own frustrations-- about fatherhood, about being a husband, being a man, being human-- through Douglas, and these moments were the most insightful, like little beams of light opening up through the book's pages. I really enjoyed this book, I just hope they don't make a horrible film out of it and ruin it like they did with One Day.